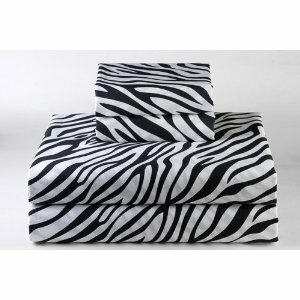 Wild Thing- Sure as Kilimanjaro rises above the Serengeti, you’ll sleep like an animal on these zebra print sheets. Walk, no, run on the wild side (especially if there are lions around). And –to be a little more serious– you will give a great fashionable look to your bedroom! Available in all sizes. * Fitted Sheet: 39 X 76 X 12(Depth) Inches. Flat Sheet: 66 X 96 Inches. Standard Pillowcase: 20 X 30 Inches.